In case you haven’t heard, in addition to the usual 8 and 9 ball pool games, there is a little known, and challenging, alternative. The game of One Pocket is played with a cue ball and fifteen object balls, numbered 1 through 15, using only the two pockets at the foot of the table for scoring (called the “target pockets”). Players score by pocketing object balls in their designated pocket. You win the game if you score eight balls before your opponent does. The game can be played by either two players or two teams. “One Pocket is a game for two players or two teams, where each player or team can only score into one of the two corner pockets on the foot end of the table, while the other player or team can only score into the other corner pocket at the foot end of the table. The other four pockets are neutral pockets, and any balls pocketed in a neutral pocket are spotted at the end of the shooter’s inning. There is no requirement to ‘call your shot’ in One Pocket, and no special order or significance to any numbered object balls. You will need the skills to both plan your strategy and also make the shot. 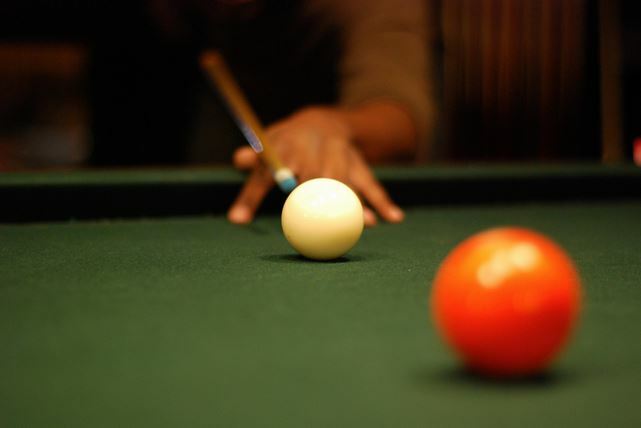 It’s best to have a foundation of pool skills (at 8-Ball, 9-Ball or Straight Pool) as One Pocket is not a game for beginning players. One Pocket is less about ball running, and more about maneuvering. Don’t think this will be a boring game though. The demands of the game will definitely improve skills like banking, safety play, speed control and cue ball control. One Pocket may be your favorite game you’ve never heard of yet, so give it a try. Find a partner, or partners, who have skills that are a good match for yours, and have a go at it! To get an idea of how the pros play, here is an article about “Stunning Safes” in One Pocket. Pool Photo by Marco Anthony – Thank you, Marco! Psst… Want to know about The Secret History of Billiards? It’s on our blog!